Snow slowly made its way to the ground from the gray skies above the already dreary countryside of Gilneas. As the night drew on, a few, namely children, would occasionally poke their heads out in the dying light to see how much had accumulated, before being told to close the door to keep the heat in. That night they would squirm with anticipation for the next morning, for they knew that the next morning was going to be one of those mornings. It would be one of those morning where the ground outside was no longer a just an environment for play. Over night it would become a canvas to be painted on, with the tools needed to do so scattered here, there, and everywhere in a smooth artist's palette left behind by mother nature for people to do with as they would. Not only this, but they would have free reign to do so. A day full of snow was not a day to be taught, and many chores, outside of animal feeding and perhaps scraping a path to the road, were out of the question. It was a day that was intended to be spent running about. There were snowball fights to be fought, snowmen to build, and snow angels to be made. At one house out in the countryside with a fair view of a nearby port, two children, a boy and a girl, would go bursting out of the house, running about with no sense of purpose for the longest time. They would be bundled up as best as they could manage on their own, tightly in coats, with mittens and thick socks and boots, lest they face their mother's wrath once she'd finally stirred. Their parents were still resting, taking the day to sleep in. It was only a matter of time before one of them fired the first shot, and in this case it was the girl. Soon enough snow was flying across the yard as the both of them scrambled to produce more ammunition, screaming, shouting, and laughing the entire time. “Hey!”-s and “Got you!”-s were exchanged as each tried to produce some sort of protection in the way of a fort. Suddenly both would be struck from the side, first the boy, then the girl. Their gazes shot to the new assailant, expecting someone from down the road ready to join into the fray, only to find their mother smirking at them, bundled up just as they were, hands stained with white snow. The fight began again with the three scrambling to get off equal shots at each other. Once they were all covered in snow, they began to slow, finally ceasing their conflict. One suggested that it was purpose time for a more peaceful project, and so began the construction of a snowman. When the snow was in place, they went about gathering items. A few stones from the path to their house fit the bill for the face. A carrot from the warm inside formed a nose, and a scarf was retrieved as well. They stood together, admiring their creation, when the children's mother turned to head inside yet again. 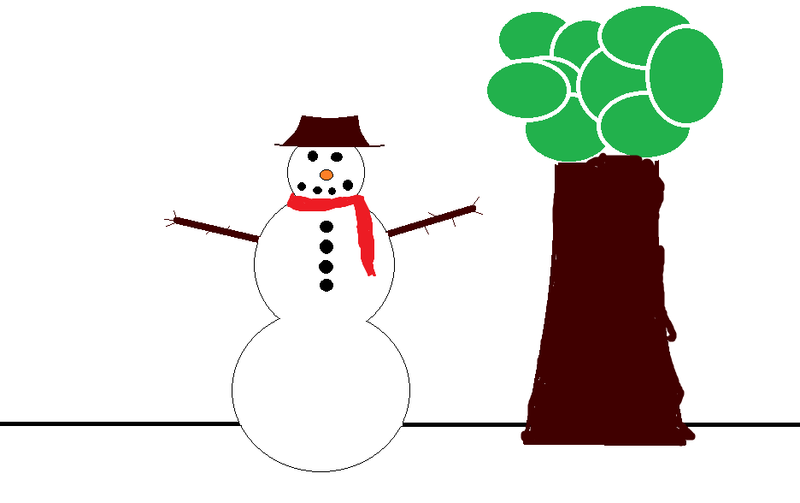 She returned in a moment, an item clutched in her hand and soon placed on the snowman. The two snickered to themselves, nodding in approval, before they all retired inside.